Posted by Jon in Review, S.H. Figuarts, Star Wars with 0 comments. I need a new line to collect like I need a hole in my head. In fact, double that sentiment for Star Wars. I have boxes upon boxes upon boxes in my storage area that tell me I never need to buy another Star Wars figure as long as I live. However, I have this collector mentality issue. “Buy shiny new thing now, feel guilt over it later,” is my mantra. Hasbro’s Star Wars Black six-inch series should have been my jam. However, they released one REALLY good figure, and then decided that they didn’t really need to try anymore. To be fair, Figuarts didn’t catch me at first. They released a questionably sized Vader and a Jedi Luke that looked more like Toby McGuire (of The Wizard fame) than Mark Hamill. Then something happened. Bandai decided (or at least I finally noticed) that they were all in with Star Wars. Where, in my opinion, Hasbro went downhill as the line went along, I feel that Figuarts is doing the opposite by attempting to improve upon the early hiccups and growing pains of the line. At least that is what it seems like with their reveals so far this year. They’ve also revealed too much for me to go all-in on their line. I strayed with the Hasbro line and probably will a bit here too, but I’m going to stick to mostly prequel-only characters with the Figuarts line. Darth Maul is the first prequel character in the S.H. Figuarts line and my starting point. So let’s examine whether he can sell or dissuade me from continuing down this expensive path. 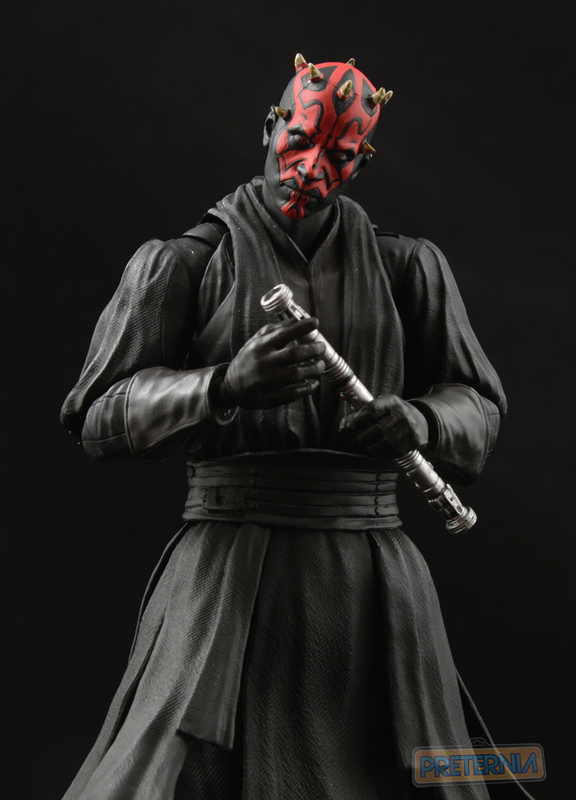 Maul comes packaged in a standard black framed window box and includes the following accessories: three extra sets of hands, an alternate head, a full-sized double lightsaber, a split double lightsaber, and two red lightsaber blades. You may noticed that I have no box pictures, this is because I could not for the life of me figure out how to penetrate the glare of the window box. If anybody reading this has any photography pro-tips for reducing action figure packaging glare I would LOVE to hear it. All of the accessories are great, but I felt a little underwhelmed with how many we got. While Hasbro’s Maul isn’t an overall better figure, he did come with a much nicer variety of accessories. The one that sticks out the most to me is the hooded head attached to the cloak. Had Hasbro never done that look I wouldn’t have even thought to ask, but since they did I need it. The precedent has been set. There is no going back. His binoculars would have been cool too, but I’m not nearly as attached to those. The included alternate hands are great, but I’m a little worried about the wrist pegs. They seem very strong, however, they are also very tiny. Then on top of that it takes a decent amount of pressure to both pull them off or put them on. The neck peg is the same way. I quickly found out how sharp the horns on the top of his head were when I did my first swap. The pegs haven’t actually broken on me, or even shown any stress marks but they still make me a little anxious. As an action figure, Darth Maul does not disappoint. I don’t need to break down the articulation. There is a ton and it is all useful. The most important thing about this Maul that puts him far ahead of any others is that he can stand unassisted. No matter how far you spread apart his legs he’ll stay up. He has an amazing center of gravity. The biggest issue I had with the Hasbro Maul was his inability to stand, at least not without a very forward leaning pose. His robes have a matte finish that is perfect. When you compare him to the Hasbro version it really makes the latter’s plastic look so much cheaper. Darth Maul has a very minimalist paint scheme as most of his clothing is straight black, but he lives and dies with the face work. As expected the face and head’s paint is very sharp. I always thought that Hasbro had done a really good job on their Maul’s face, but if you put the two together there is no comparison. 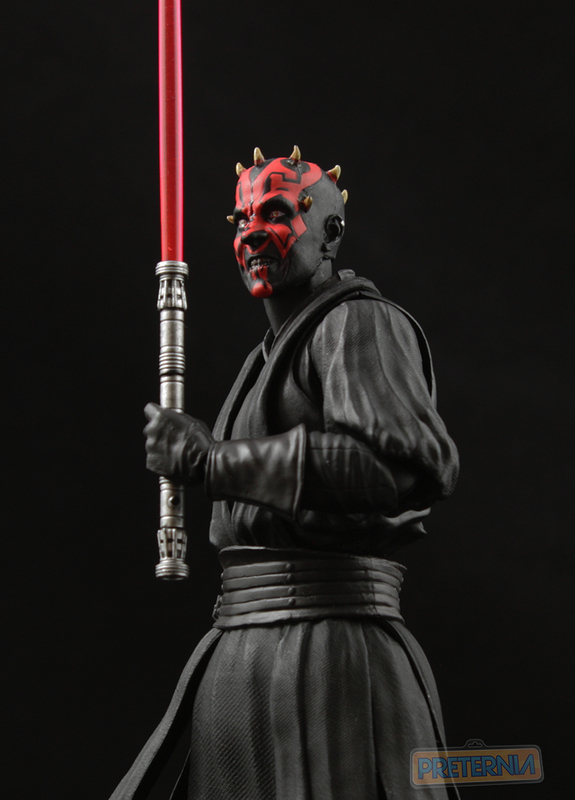 Figuarts really has pulled off a damn nice looking Maul. I was a little late to the game in getting Darth Maul. He’s been out in Japan for a little while now, and can actually be tracked down domestically for decent prices. Expect to pay between $55 – $65 with shipping to get him. Is he worth the higher price tag? Absolutely. 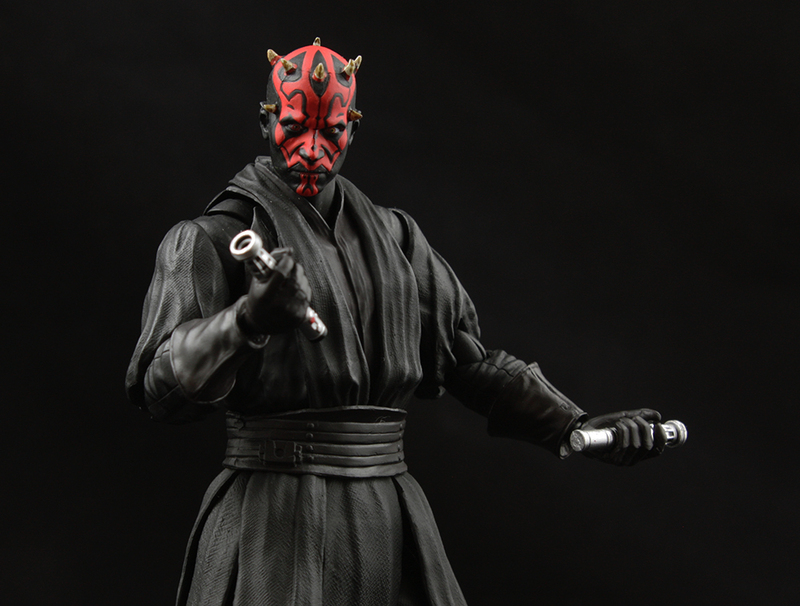 If you want the best Maul in your collection then this is the guy to get. Unless they do a second version of this guy with the various accessories I mentioned above, this is the quintessential Maul. Looking to get him now? Amazon currently has him in stock at a great price!